Being the perfect host and hostess is a lot harder than it used to be. Keeping up with your guests’ growing list of food allergies and dietary restrictions can be a challenge, but it’s one we at La Prima Catering are happy to meet. Over the years, I’ve seen more and more people being diagnosed with allergies and sensitivities to food. Add to that the number of people who are choosing special diets and you can end up having to accommodate vegetarian, vegan, gluten-free, lactose-free, halal and kosher guests – all at the same event! La Prima Catering creates thousands of elegant meals each year and we take the food allergies and sensitivities of our clients and their guests very seriously. In fact, it’s one of the first questions we ask a client when we meet. Often we will amend existing recipes or create new ones altogether in order to comply with a special dietary request. Last year we did a Cocktail Reception for the National Foundation for Celiac Awareness. Our Chef, kitchen staff as well as the servers and bartenders assigned to that event took an online course and became certified by the NFCA Association. It was an experience that sharpened our sensitivity to the serious issues of food allergies and better equipped us to deal with our clients’ needs. We often get calls from guests or parents of guests of an upcoming event. They’re worried there won’t be anything for them or their child to eat. We are always happy to field these calls – it gives us a chance to share our philosophy of making sure each and every guest feels “catered” to. Even if it means creating a special dish for just one guest! For food allergies, Gluten is at the top of the list. But, when you’re talking dietary restrictions, we see more and more requests for Vegetarian and Vegan events. In the past, clients might have asked for one or two dishes to be vegetarian or vegan friendly, but now we often get requests to do entire vegetarian or vegan receptions. Even if the majority of guests are meat lovers, clients want their event to reflect their tastes and they’re excited to introduce their guests to innovative, delicious, seasonal and socially responsible foods. This is such an important issue these days. And it’s important to ask your prospective caterer about their knowledge and comfort level preparing special meals. At La Prima Catering, we confidently prepare vegan, vegetarian, gluten-free, dairy-free, soy-free, nut-free, low-salt, halal, kosher-style and other special meals each and every day. Our goal is to create the most delicious experience for you and all of your guests. We’re caterers and that’s what we do! Sarah loved The Highlands Mansion and Garden since she was a little girl playing in the garden and riding horses. She dreamed of getting married at this idyllic 18th century site; a true romantic. On September 17, 2016 her dream came true when she joined her life with Colin. Creating a romantic experience for all her guests, Sarah made the table floral centerpieces herself. Her dear neighbor baked and decorated a Naked Wedding Cake and the photos we share here were taken by a friend. They made the garden a place of repose for their guests with a photo booth and board games laid out on blankets. The celebration meal began with a salad of Mesclun Greens with Granny Smith Apples, Blue Cheese and Walnuts. There was Roasted Salmon with Fruit Salsa, Herbed Chicken with caramelized onions, Garlic Mashed Potatoes and a Melange of End of Summer Vegetables. To drink there was Iced Tea, Strawberry Lemonade and refreshing Cucumber water. It was a wedding of scented warm breezes, laughter and love. One of our goals is to make it easy for everyone to reduce their environmental impact, so we’ve compiled a list of 5 easy ways to help create the perfect eco-elegant event. Print your event invitations on see d paper. Guests are able to plant the invitation and watch beautiful wildflowers grow! Visit botanicalpaperworks.com to check out their products. Donate leftover food from your event to a local food bank. Check with your venue and caterer to discuss options. Provide guests with one cup to use throughout the night to reduce water waste. Add some character to your event by making your guest’s glasses their seat markers. Use succulents rather than cut flowers as your table centerpieces. They’re incredibly low maintenance and your guests will be able to enjoy them for months to come. Check out thesucculentsource.com or your local nursery for options. Use soy candles to light up your event. Using 100% natural soy candles won’t increase the CO2 in the atmosphere and they release essential oils as they burn. Visit the Philadelphia based Duross and Langel store or go to their website to find handmade soy candles. Planting our urban garden is a Spring endeavor involving everyone – general manger, chefs and kitchen staff. This year we planted Basil, Parsley, Thyme, Cilantro and Scallions. Our tomato plants will yield Plum, Cherry and Grape. And, of course, the lovely flower Marigold will be used for garnish. And did you know they make a wonderful natural insect repellent?! Here is just a taste of what’s popping up in the heat of summer. Pronounced “keen-wah”, this gluten free, complete protein grain is super popular for vegetarians and carnivores alike! As a complete protein it provides all nine essential amino acids necessary for good health. It’s a native of Bolivia and a relative of Swiss chard, spinach and beets. Who knew?! Some studies show a decreased risk of inflammation related problems, including obesity, when eaten daily. Enjoy! Combine vegetable broth, quinoa bay leaf, turmeric, salt, pepper, lemon zest and olive oil in a saucepan. Bring to a boil, reduce heat, cover and simmer until tender. About 20-25 minutes. Once tender, remove from heat and drain if necessary. Spread out on a plate to cool the grain. 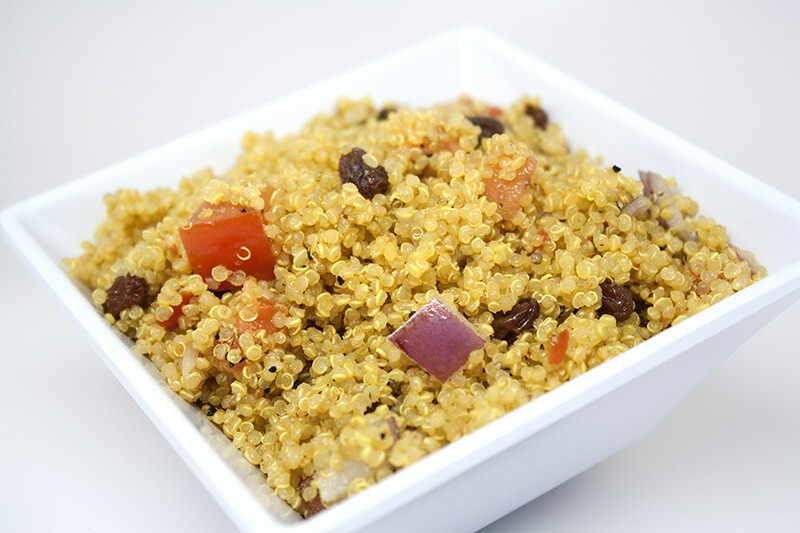 In a bowl add cool quinoa, tomato, red onion and raisins. Whisk together dressing ingredients and pour into bowl. Mix and let chill for 2 hours. © 2013 La Prima Food Group, Inc.